What can you buy for 44� in today's economy? Not a cup of coffee or a soda or even a pack of chewing gum. But you can get answers to some of your most difficult genealogical questions. The U.S. Postal Service can bring those answers right to your doorstep for the price of a first-class stamp. The internet has truly changed the pursuit of genealogy forever, and generally speaking, definitely for the better. But I am dismayed when I find my local Family History Center has curtailed its hours by half because of the plummeting demand for genealogical research. And when I take a trip to the Family History Library in Salt Lake City, the number of researchers I see there is down more than 50% from just five years ago. Talking with other family history enthusiasts, too often I hear the opinion that everything needed for research is online. Nothing could be further from the truth. Nor is it the case that everything needed is available at the Salt Lake City library. Although both resources are vast, and continually growing, millions of records are out there that require more diligent searching, and often that searching is best conducted from your own home--for 44�. For truly thorough research, there will never be one-stop shopping. But with some detective work and persistence, you can determine where to look for records that can fill in gaps and open new avenues to explore. For over five years, I had tried to track down the birth location of John Hanley, one of my great-great grandfathers. Enumerated in Milwaukee, Wisconsin, in 1850, 1860, 1870, 1880, and 1905, his state of birth is consistently listed as New York. His parents had emigrated from Ireland sometime after the birth of John's older brother Michael and before the birth of his older sister Margaret in Canada. The family's next two sons, James and John, were both born in New York. But where? Knowing the family to be Catholic, I had scoured applicable New York City church records available on microfilm, without success. I researched all of John's children and his siblings' children for many years before getting my first break. One niece's death certificate listed her father's birth location as Utica, New York. Utica! Not a place I had ever searched. Checking the Family History Library's catalogue for Catholic records from the 1830s, I struck out. But the search wasn't over. 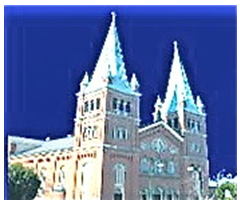 Turning to the internet for existing Catholic churches in Utica, I found Old Saint John's. First, I called the church office, but the overworked, understaffed secretary was really unaware of what records might exist from the 1830s, and she didn't have the time to go looking. Time for postage stamp genealogy. I wrote the church explaining my search and providing specific names and timeframes. I offered to pay for the lookup and enclosed a self-addressed, stamped envelope. Within two weeks, my five-year-long search was over. A volunteer church historian sent me a photocopy of four faded baptism records: James Hanley, son of James Hanley and Mary McEvoy, 28 May 1837; John Hanley, son of James and Mary, 3 October 1839; Michael Hanley and Edward Hanley (the latter with a notation of birth 23rd of February 1841) 15 May 1841. Without doubt, this is my immigrant Hanley family. Although they are fairly common Irish names, the identification of Mary McEvoy as the mother of son James provided certainty, because I already knew her maiden name from Wisconsin probate records. There was no charge for the search or the photocopy, just a note of thanks for providing the self-addressed, stamped envelope. The church secretary was too overwhelmed with her job to go looking among old records for my Hanley family, and it was easy to say so on the phone. But a letter, with a SASE enclosed, can be handed over to a volunteer who undoubtedly enjoys locating a genealogical treasure for someone else. If someone helped you get started in genealogy, you probably were advised to interview your older relatives, sooner rather than later. If you live near those folks, going to see them to ask about memories of their own and earlier generations is an excellent approach. But if a trip to Aunt Lois's house is geographically out of the question, consider postage stamp genealogy. Call her and start talking about family history in general; tell her of your interest in collecting and preserving family information. But this is not the best way to get those specific dates and places you need for your research. Follow up the call with a letter including a few specific questions about names, dates, and places for events in her natal family. Don't overwhelm her by asking too many questions at once, and leave room on the page for her answers. Very importantly, be sure to enclose a self-addressed, stamped envelope for easy return. That letter and those questions will give your relative time to reflect, and when she returns the answers, write her back to thank her and send some follow-up questions. Our older relatives may not be computer-savvy, and good old-fashioned letter writing might well succeed when an email or a phone call may not. A letter allows time for more careful recollection, and you may be rewarded with interesting stories, as well as some names, dates, and places. Distant cousins can be another potential source of genealogical gold. Obituaries are good places to find names of such relatives, but it's not always easy to move from discovering living relatives' names to actually contacting them. Finding phone numbers is becoming more and more difficult as many people are giving up their land-lines in favor of cell phone service only. The problem then becomes one of locating a relative whom you perhaps have never met. There are sources on the internet, both subscription and free sites, such as http://www.whitepages.com if you know a city. But I am finding those sites frequently have addresses for people, but no phone number. Postage stamp genealogy to the rescue. It may take more time to write a letter than to pick up the phone or fire off an email, but don't let that deter you. Use the address listed in the white pages and write your unknown relative. Again, be sure to include a self-addressed, stamped envelope. That enclosure makes it easier to reply, harder to ignore. I have found more than a dozen distant cousins this way, cousins who have puzzle pieces I need in my research and sometimes priceless old photographs. I in turn send information and photos they lack. Last year, I located such a McMillen family cousin in Fort Atkinson, Wisconsin. I really had little hope of finding this woman, because her name is Susan Smith. But, since Fort Atkinson is not exactly the largest town in the state, I decided to give it a shot. Finding two addresses for a Susan Smith in Fort Atkinson, I wrote them both, identifying myself and how we are related (if we were indeed related). I asked each Susan if she could answer a few questions about some mutual relatives. I was rewarded not only by finding the correct Susan, but also by receiving unbelievable genealogical treasures, including photographs from the 19th century of a set of my great-great grandparents (who are her great-grandparents), letters to various family members, and a set of 12 yearly journals written by Livingston McMillen, her grandfather, a brother of my great-grandfather. She sent them, apologetically saying she had leafed through them but found they mostly concerned crops and the weather. I read every page of the 12 volumes and was thrilled to learn about farm life in 19th-century Wisconsin, and delighted with the few tidbits of family history included, often as a passing remark. I learned about a stillborn baby, previously unknown to me. Tucked in after the weather report, Livingston wrote of his daughter's birth ". . . the little angel never drew a breath." And the following day, again after the weather report, he wrote ". 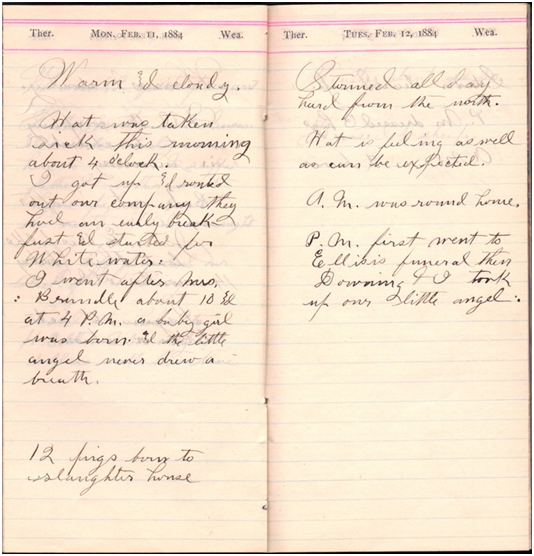 . . went to Downing [a nearby town] & I took up our little angel." I added this child to Livingston's family group sheet, naming her Angel. Frequently he mentioned out-of-town visitors, people who were until then just names in my McMillen records. My whole understanding of rural life changed dramatically as I read about the family meeting the two trains that stopped in Fort Atkinson daily. My relatives were travelers, off to the Upper Peninsula of Michigan, down to Iowa, coming in from Minnesota, and even taking a tour out West to see California. When I look at all the material Susan sent me, I am overwhelmed to think how my knowledge of the McMillen family grew because I wrote a letter to a stranger, who I wasn't even sure was indeed my distant unknown cousin. What remarkable family history treasures are out there waiting for you to find? Don't think anyone is too distantly connected to be helpful in your research. Definitely track down people whom you may have overlooked because they are not your bloodline--perhaps they married into your family. But until you write and ask, you never know who is the keeper of family photographs, journals, letters, and other memorabilia. Assemble a list of what organizations or governmental agencies might be helpful in your search: churches, libraries, historical groups, genealogical societies, archives. Search online for such repositories in your area of interest. Above all, remember to enclose that self-addressed, stamped envelope, and offer to pay for copying expenses. With persistence, you may be amazed what 44� can bring you!